dpm is a Birmingham-based freelancer with experience of arts and lifestyle features. Birmingham's BE FESTIVAL gives local audiences the opportunity to sample a huge range of different art forms from across Europe. The five day festival at the city's Repertory Theatre is packed full of half-hour performances in dance, theatre, art, mime and circus. A day ticket brings you four productions, the chance for dinner on stage at The Rep, visual arts around the theatre space and a late-night music performance plus there is also opportunities to take part in workshops, debates and feedback discussions. To house the festival, the theatre is turned on its head with the workshops and rehearsal rooms becoming places for performance and debate and its stage transformed into a huge restaurant. Entrance to the festival is at the back of the theatre directly into a huge space filled with armchairs, music and a bar. The festival atmosphere is fostered with 'karma' money notes to buy drinks and cakes, fake grass and portable toilets. With many of the festival-goers also being performers from across Europe there is a babble of excited discussion in a host of different languages and the chance to find out more about many of the productions being showcased. Once into the auditorium, seats are unassigned and everyone is handed a feedback form in which they are asked to mark each production on a scale of 1-5 and include comments. The evening I reviewed (6 July) saw a mix of shows. The first was Légende by Romain Teule, an artist who shares his time between France and Portugal. Billed as a 'performance lecture on the nature of language', Romain plays with words in a scenario in which he appears to be giving a talk to the audience about a study into bird communication. By mispronouncing and misusing words in this lecture, Teule makes us all question how a word is interpreted and can be misinterpreted. His use of the word hedgehog out of context has us all thinking of cute spiky garden mammals until he switches on the screen to an iconic scene from Alfred Hitchcock's The Birds and we realise that hedgehog actually means Hitchcock. Teule's production is clever and his performance quirky but even at half an hour, Légende feels over-long. Once the point has been made that words can be misinterpreted when mispronounced it doesn't feel like he has much further to go. Next was Spain's Kulunka Teatro with Solitudes. 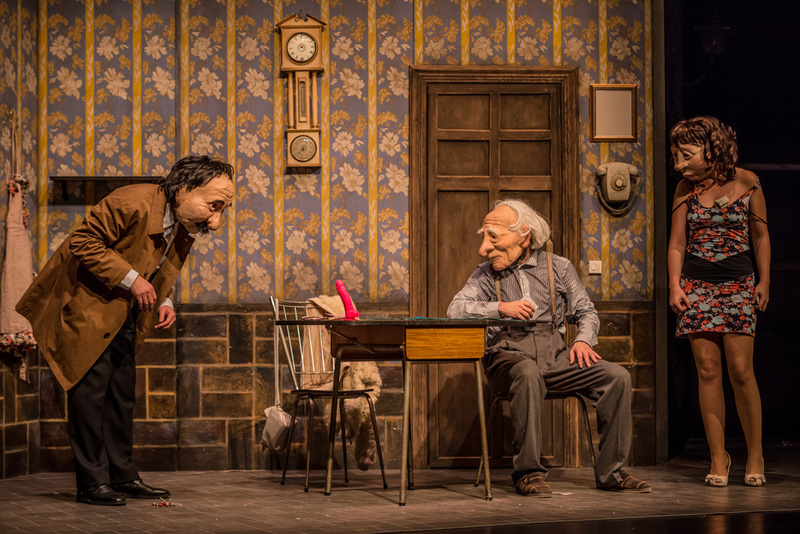 Using full masks, this production takes the audience into the living room of an elderly gentleman suffering from loneliness. An excerpt from a longer show, it nevertheless quickly draws empathy from the audience for this gentle old man who just wants a bit of company – someone with whom he can play his greatest love, cards. When family members drop in they are so preoccupied with their own lives and the essential tasks involved in a visit they never seem to find the minutes to spend a bit of quality time entertaining the old man. It's a simple but powerful message about society's desire to sweep the social needs of elderly people under the carpet and is told in a poetic and gentle way. After a break for dinner, the audience returned to Betelgez, which sees four dancer-acrobats performing feats on and around a giant see-saw and suspended from the ceiling. 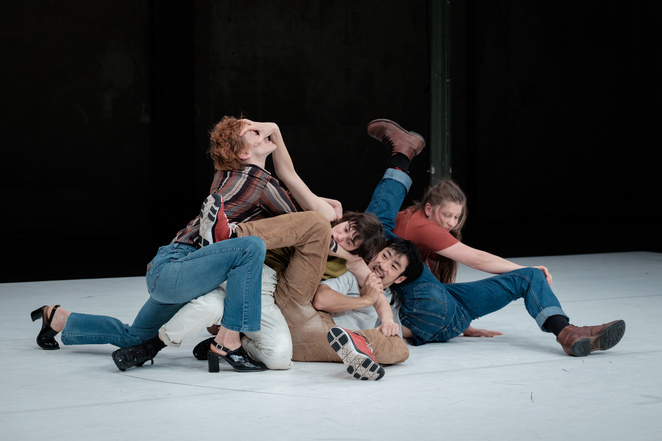 Created by Greece's Ki Omos Kineitai, the production aims to explore stability and instability through balancing and not balancing of performers as they move over, under and across the see-saw. This takes place against a series of songs and political speeches in a range of languages. Different audience members will therefore understand different speeches but all are highly charged political rhetoric covering war, unrest and social divide. The physical risk of falling reflects the political risk of unrest and the pace speeds up until one dancer-acrobat is literally grasping at the see-saw to ensure he does not fall. The performers are highly skilled artists able to cling on – which is hopefully a positive message as we face such international and national political and social uncertainty. Finally, Anna Aristarkhova's Obnimashki gives a light-hearted look at the hug. A cast of five dancers engage in single, double, triple, quadruple and quintet hugs. In doing so, they constantly redefine the hug as a gesture of warmth and friendship, a gesture of lust – and even a gesture of violence. Equally the hug can produce a feeling of inclusion, if you are on the inside, but also a feeling of exclusion if you are left out in the cold. Obnimashki culminates with an invitation to audience members to gradually join the hug so it creates a fitting conclusion to the theatrical element of the evening. BE FESTIVAL continues until 8 July. See www.besfestival.org for more information.